La Fête Nationale Du Québec (formerly Saint-Jean-Baptiste Day), Québec statutory holiday, observed on 24 June since 1925. 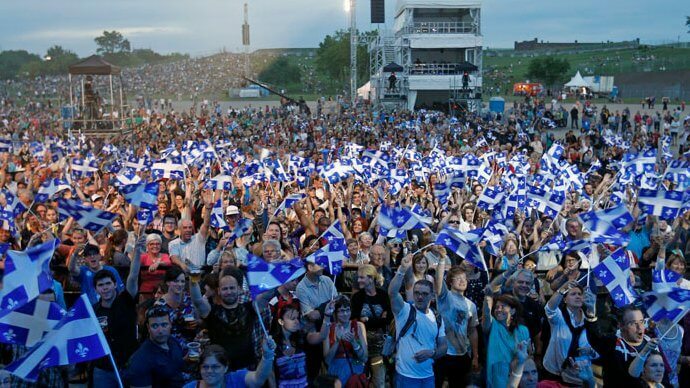 Saint Jean Baptiste Day is also known as "la Saint-Jean", "St John the Baptist Day", "Fête nationale du Québec" and "Quebec's National Holiday". In North America, Saint-Jean-Baptiste has been celebrated since the beginning of New France. Since ancient times, people have celebrated the pagan custom of the summer solstice, lighting bonfires on the longest day of the year. In France, the solstice became associated with Saint John the Baptist, the cousin of Jesus who recognized and baptised him; both the solstice and John the Baptist are associated with the coming of light into the world. The tradition of lighting the Saint-Jean fire to mark the beginning of the summer was transposed to New France as early as 1646. In 1694, Monsignor de Saint-Vallier made it a holiday devoted to devotion. Saint John continues to be celebrated after the Conquest, but it is only in 1834 that it takes on a political color that it will preserve until today. René Lévesque sanctioned the celebration as an official holiday on 24 June 1977, eliminating the religious connotation and making it a statutory holiday in Québec.